Recently, I found a Steiff / Swarovski Limited Edition Bear on the internet and did a short article here on the Kristall Buzz about the bear: Steiff Bear Sapphire is a Limited Edition Bear. Following that article, I discovered another Steiff Bear decorated with sparkling Swarovski crystal stones. This new teddy bear is Krystina. The bear features jet black coat of mohair. The right bear paw uses over 150 encrusted with Swarovski Elements stones to spell out Steiff. She wears a collar decorated with over 100 Swarovski crystal stones. She has a white label with the famous Steiff button in the ear. Steiff Krystina is a limited edition bear, to be available only in 2011. The Krystina Steiff Bear can be purchased from the Danbury Mint UK site. Yesterday I learned of some another contest for a Swarovski Limited Edition gadget…a Swarovski Union Jack Cardholder. Not much information is given on the Swarovski Cardholder. The advertisement page does indicate that 50 of them are being given away. From the picture, it can be seen that it is decorated with red, blue, and silver Swarovski crystal stones. This give-a-way is a part of the Swarovski crystallized Mini Cooper / Royal Wedding promotion done by Swarovski and Magic 105.4 in the UK in the week preceeding the Royal Wedding. Bazooka candy brand is now in on the ‘royal wedding’ action! Bazooka has added some Swarovski crystal bling to a (non-edible) sapphire ring pop, that’s design is supposed to resemble Kate Middleton’s engagement ring. The limited edition ring consists of a large royal blue component and is surrounded by small Swarovski crystals and has a small crystal stone on the top of the sapphire-like element. This is a limited edition Swarovski crystal decorated ring pop. One site stated that there were only 50 of the blinged ring pops produced. I did not find any web sites or online stores actually selling the Bazooka non-candy ring, but found several instances of them being given away. There is some exciting news for Swarovski crystal fanatics and ring pop fanatics, there is a contest on Facebook to WIN this fancy faux sapphire ring pop. The Facebook page is http://www.facebook.com/ringpop . Deadline for entries into the contest is April 29, 2011 at noon EDT. Good luck if you decide to enter the contest to win the Swarovski crystal and faux sapphire (non-edible) Limited Edition Royal Ring Pop by Bazooka! I am amazed by all the information that continues to surface about the Swarovski Crystal Mini Cooper that was on display at Westfield, London in the UK April 23. It was produced by “Bling My Thing” in Berlin. It utilizes 300,000 hand-set Swarovski crystal stones using the familiar Swarovski Swan in such a pattern that they appear to be flowers. Additional photos (12 more!) of this expensive royal ride can be found on the Bling My Thing blog along with the “William and Kate” from the Westfield shopping center event. There is good news for the UK Swarovski crystal fanatics who missed the April 23rd viewing / wedding celebration with the Magic 105.4 radio station. The Swarovski Mini Cooper is to be moved and remain on display at the Swarovski Flagship store (address: 321 Oxford Street) until May 1, 2011. Swarovski has posted a short video of the Swarovski Mini Cooper on YouTube. In it, you see the white Mini Cooper blinged out with big Swarovski crystal swans on all sides of the car. The top of the Mini Cooper is a British flag. The crystal brand included several consumer interviews during the video clip, and all were happy to take away a complimentary Swarovski Wedding Pen. The look-alike royal couple posed for photos with the car and attending patrons. This is not the first Mini Cooper to be embellished with Swarovski crystals. I found several articles about a Swarovski Mini Cooper decorated in 2008, which had been dubbed an ‘American Icon’. Utilizing over 1,000,000 Swarovski stones, this Swarovski Mini Cooper features pictures of scenery only found in USA, such as: The Statue of Liberty, Mount Rushmore, The White House, The American Flag and Eagle, and more. This other Swarovski Mini Cooper has toured the USA and been displayed in museums in the past. Happy Easter to Swarovski collecting crystal fanatics around the world! May all remember the true meaning of Easter … that Jesus Christ died on the cross to save us. My friend Mary’s favorite piece of is the Swarovski crystal Cross of Light. It has a special place in her heart representing her strong faith. 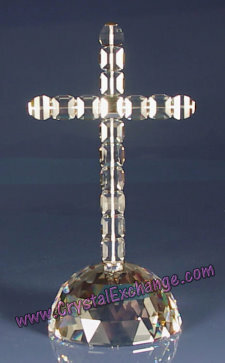 The Swarovski Cross of Light is a retired Swarovski crystal figurine. The Cross of Light was produced from 2001 to 2004. The Swarovski designer of the Cross of Light was Stephano Ricci. It is about 7″ tall and originally retailed for $385. The Swarovski Cross of Light is not always easy to find. Crystal Exchange America does not presently have this item available. However, if you like the online auctions, here are ebay listings for the Swarovski Cross of Light. I checked the average selling price over the last 3 months, and it ranges $175 – $300. Swarovski has created some jewelry designs featuring crosses, and Crystal Exchange America does have some available: Swarovski Cross Necklace and a Swarovski Cross Pave Charm. Visit their web site at CrystalExchange.com and look in the jewelry category. Swarovski has gone from crystallizing the FUSE Violins, used by Ben Lee and Linzi Stoppard, to crystallizing a Mini Cooper! The Mini Cooper has been crystallized Swarovski to celebrate the Royal Wedding of Prince William to Kate Middleton at the end of April. The crystal brand has teamed up with a radio station in London, Magic 105.4 to show off this blinged up Swarovski Mini Cooper, complete with look-alike bride and grooms representing the future royal couple. The car and couple were making their appearance April 23rd at the Westfield shopping centre (and I guess if you are in London, you may know where this is). During this one-day event, Swarovski will be giving away the limited edition Swarovski Wedding Pen (more information about the Swarovski Pen in our blog post dated April 9) AND having a contest in conjunction with the radio station to give away £20,000 to an engaged couple. I was not able to find any pictures of the Swarovski crystallized Mini Cooper. Since there was a photo op for people, including the car and look-alike couple, I may be able to find some pictures in the next few days. As of now, the crystal giant has not indicated its future plans for the Swarovski crystal Mini Cooper. I recently did an article about a Swarovski Limited Edition Pen, a UK exclusive, to commemorate the royal wedding of Prince William and Kate Middleton. Since then, I have found more Swarovski Limited Edition memorabilia. This discovery is for the Swarovski Royal Wedding Prince and Princess Ducks. The Swarovski system # is 1117976. This pair of Swarovski Royal Ducks is a limited edition set with only 3000 pairs produced. They are packaged in a single box and retail for approximately $115 USD. The Swarovski Royal Wedding ducks are essentially the Swarovski Happy Prince and Swarovski Happy Princess figurines, but wait! These Swarovski ducks come in a single box. The Swarovski Happy Prince duck of this pair has the royal wedding date (April 29, 2011) etched on the back of the duck. 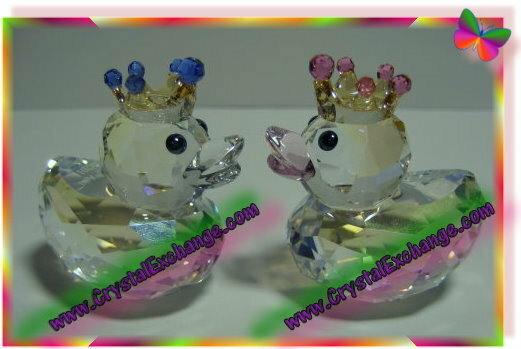 The Swarovski Happy Princess duck of this pair has two wedding rings etched on the back of the duck. This is interesting in that Prince William will not be wearing a wedding ring. The Swarovski Limited Edition Royal Wedding Ducks can be found in select stores in the UK, including Clifton Collectibles. Separate boxes and missing ‘special’ marks are indications that items are being mis-represented as the Swarovski Royal Wedding Ducks. I’m still watching for additional collectibles that use Swarovski components. However, as the date is soon approaching, I can imagine that the window of opportunity for manufacturers is quickly coming to an end. Thank you Phil at Clifton Collectibles for your contributions to this article! Our favorite crystal giant is hosting several Swarovski Events, with Swarovski designers in attendance to sign their creations. Swarovski designers scheduled to attend are Anton Hirzinger and Elisabeth Adamer. Anton Hirzinger has created over 120 Swarovski figurines. This Swarovski designer is credited for the following 2010 and 2011 Swarovski crystal releases: Swarovski Arctic Hare 2011 SCS, Swarovski Polar Bear Cubs White Opal SCS, Swarovski Polar Bear Cubs Crystal Moonlight SCS, Swarovski Arctic Flower Ornament, Swarovski Siku Polar Bear 2011 SCS, Swarovski Soulmates Bear, Swarovski Lovlots Nick (Hedgehog), Swarovski Lovlots Spike (Hedgehog), Swarovski Lovlots Romeo (Frog), Swarovski Lovlots Ted (Bear), and Swarovski Soulmates Swan. A longer list of the Swarovski Anton Hirzinger designs can be found at the Swarovski site (but does not include the Crystal Moments figurines). for the following 2010 and 2011 Swarovski crystal releases: Swarovski Sea Goldies Topaz, Swarovski Surgeonfish Scuba Blue, Swarovski Batfish Smoky Quartz, Swarovski Myriad Alsaqr Alamake (Limited Edition), Swarovski Tiger 2010 SCS, Swarovski Tiger Kiran, Swarovski Fire Ornament, Swarovski Tiger Cub Standing SCS, Tiger Cub Sitting SCS, and Swarovski Bee-eaters. A complete list of the Swarovski Elisabeth Adamer designs can be found at the Swarovski site. Can you bring your own Swarovski figurines, or do they need to be purchased the day of the event from the hosting store? Will the Swarovski designers sign retired Swarovski crystal? If not, then only 2011 introductions will be signed. Often, it must be a current design. Is there a maximum quantity that you can have signed? Often, it is limited to two figurines per customer. Are any special purchases required, or can you attend simply to meet the designer and have a piece signed? Swarovski figurines bearing the designer’s signature do typically command higher prices on the Swarovski secondary market. 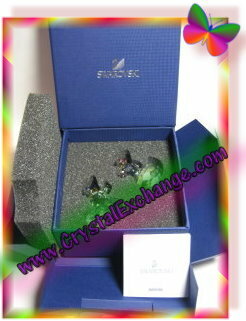 Crystal Exchange America presently has over 100 items available that feature Swarovski designer signatures. Yesterday, I mentioned that I used to spend weekends stoning dance costumes with Swarovski crystal stones. Today, I happened upon a video made by Swarovski that shows the rhinestones on dance costumes. While this is completely different from the dance competition scene, use your imagination to see how a simple costume can be transformed into an extraordinary costume using the finest Swarovski Crystal components for amazing, sparkling stage presence in a highly charged environment of dancers! My daughter used to be a competitive dancer, and I remember those weekends we’d spend, just before competition season started, stoning the dance costumes with Swarovski crystal flatback stones. We used a strong bonding material to ensure that those $30 – $50 of Swarovski crystal stones would stay on the costumes until the conclusion of Dance Nationals. Apparently, there are more uses for those Swarovski flatback stones than clothing, accessories, and dance costumes. Philip Levine uses them on his head! At the age of 29, he’s now a ‘head artist’. 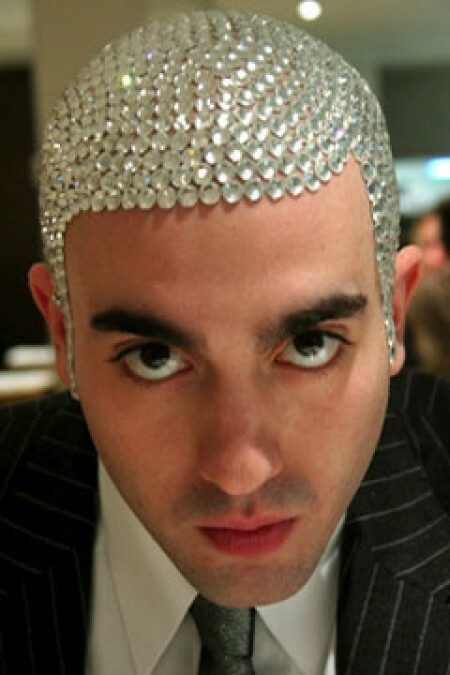 In the picture, he can be seen with his bald head covered in 1,000 Swarovski crystal stones. The stones appear to be Crystal CAL, perhaps 30mm in size. It would be interesting to see him add designs and pictures integrating some of the other Swarovski crystal flatback stones using different colors and sizes of the crystal giant’s offerings. The web site Amazing Only shows some of the other creations that Philip Levine has worn. One source indicated that most head designs only last a day or two, so some of these designs would be quite expensive. Another source indicated that this head artist has a dream to some day open a salon for ‘head styles’ rather than ‘hair styles’. It is wonderful to see Philip Levine embrace his baldness in such a unique way. Effective April 11, 2011 the Swarovski Limited Edition Hare in now available online for purchase. The Swarovski Limited Edition Hare appears to be made of smokey quartz crystal. The official color, per the Swarovski site, is ‘satin’. The smokey gray hare figurine is about 1.5″ by 1.25″. The Swarovski system number of this rabbit is 1089977. The retail price of the Swarovski Hare is $60. This cute bunny rabbit is an online exclusive and will not be stocked in Swarovski stores or Swarovski Boutiques and is not likely available for special order. The Swarovski Hare is a one-time production run. No mention as to the quantity produced (Swarovski keeps this information secret), but when it is sold out, it will likely be found at the online auctions or at retired Swarovski dealers, perhaps at higher prices. Swarovski Hare – This one is identical the the Limited Edition, but is in golden shadow crystal instead of the ‘satin’ crystal. Swarovski Benny (Lovlots Rabbit from the Circus series). This item is also marketed to be available for a limited time. So, don’t forget to get your Swarovski Hare ordered soon if this item is on your list for 2011 Swarovski crystal must-haves! 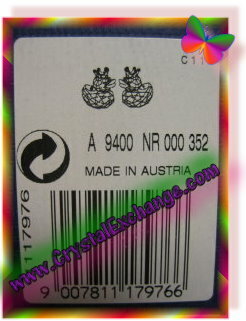 Since 1976, Swarovski has generally included a Swarovski Certificate inside the packaging for the majority of crystal figurines. While the paperwork does indeed state certificate on the front side, it served a purpose of advertising other Swarovski crystal figurines in production at that time. When Swarovski moved away from the octagonal-shaped literature, the ‘certificate’ no longer featured product photos. All along, these Swarovski certificates were very interchangeable among products, keeping in mind the production eras of the various figurines. In 2011, Swarovski has made changes to the paperwork (Swarovski COA) included the crystal figurines. In the last couple of purchases, I have not found any blue certificate, red certificate, or white certificate. Instead, I find a card labeled Certificate of Authenticity (in both English and French) on the front side, and on the backside, a reference number, date of purchase, and initials of order fulfillment person. I have found only a single card for a multiple unit purchase, not one card per item. The card is about 3.25 inches long and is enclosed in a pearlized envelope with the word Swarovski in Silver foil on the front. Plus, in the envelope is a ‘care advice’ booklet. This booklet includes brief advice on caring for ‘fashion jewelry and watches’, ‘handbags and accessories’, and the ‘crystal living collection’. This Care Advice booklet is printed in both English and French. Swarovski does continue to include unique certificates for Swarovski AE figurines. The Swarovski Siku Polar Bear has a certificate specific to the 2011 SCS crystal figurine. It does not use the newer Swarovski COA and care advice unit described above. 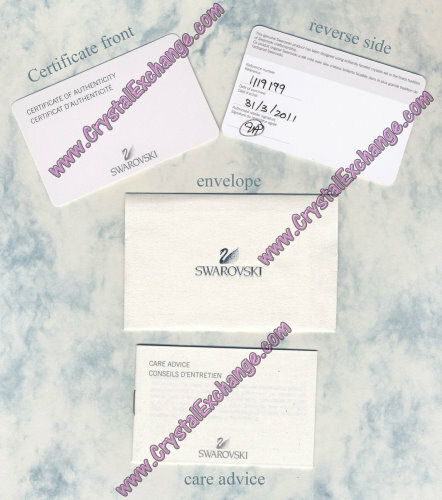 It is possible that the Swarovski certificate may be a cost-savings (every penny counts these days). It could be that this personally-dated card is used to validate a warranty period. It may be speculated that this may be a technique to close the loop on grey-market purchases…no card…no warranty support. In any case, it is becoming more important to purchase current products online or from an authorized Swarovski dealer to ensure your full warranty is honored. Collectors will have to quickly give up the notion that their new Swarovski crystal figurines will have a certificate of authenticity if multiple items are combined into a single order. Steiff fanatics may be interested in a recently released Steiff Bear decorated with sparkling Swarovski stones. This new teddy bear is named Sapphire. The bear features a deep blue coat of silk material. The bear has paws encrusted with Swarovski crystal Elements stones reflecting a rainbow of colors accenting the sapphire blue color of the bear. Sapphire is also decorated with a strand of Swarovski Elements to create a choker around her neck. And of course, she has a white label with the famous Steiff button in the ear. Sapphire is 10″ tall and retails for $280. Steiff Sapphire is a limited edition bear. There are only 2000 available. Each Steiff Sapphire bear includes a numbered certificate of authenticity and is packaged in a special Steiff gift box. The Sapphire Steiff Bear can be purchased from the Steiff USA site. Remember, Sapphire is a Steiff / Swarovski Limited Edition piece, so make your decision soon if Sapphire is going to be a part of your bear collection or Swarovski collection. Crystal Exchange America has a few retired Steiff Swarovski bears if you are looking for an older bear. Swarovski Lovlots Benny Bunny Rabbit – Swarovski Limited Edition figurine??? The latest Lovlots series was launched last month, the Swarovski Lovlots circus. Swarovski Benny is among the figurines in this Lovlots series. Accompanying Swarovski Benny Bunny are Swarovski Jade Dancing Horse, Swarovski Jasmine Dancing Horse, Swarovski Leo Lion, Swarovski Rolly Monkey, Swarovski Rosalie Dancing Horse, Swarovski Toby Elephant, and Swarovski Tony Elephant. The crystal giant has certainly advertised Jade as a limited edition Swarovski figurine in the Circus series. The site states that Swarovski Jade is a ‘Limited Edition horse available only available in 2011′. I have asked several Swarovski retailers about whether or not Benny is a limited edition, and they seem unaware of the possibility that it could be limited. I did some searching on the web, and found at least five stores online stating that it is available for a limited time only. Two store sources told me that it does not have the year on it (like other Limited Edition Lovlots). The Lovlots Circus Swarovski crystal figurines are all available for purchase on the Swarovski web site. Simply go to the web site, and do a search on ‘circus’. The search results will show the eight figurines from the series. If I should get a Swarovski company confirmation regarding the marketing of Swarovski Benny, I’ll post an update.